I am officially half-way through my 31st week of pregnancy! Unfortunately, I got a bad stomach virus early this week, and was sicker than I’ve ever been in my life. I found out the hard way that the only thing worse than the having the flu, is having the flu while pregnant. I’ll write a post later on how to survive a stomach virus while pregnant. Thankfully I am feeling 100% back to normal and I have enjoyed a few days in a row of great workouts. I ran 6 miles with my gym clients yesterday, did some lifting late this week, and just got back from a 3.25 mile recovery run. 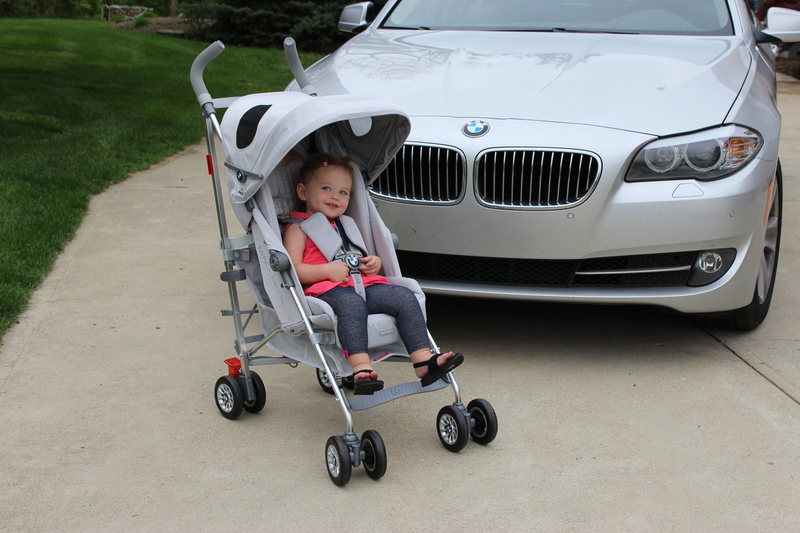 The BMW Maclaren stroller and accessories (see diaper bag pictured here) are stylish. Now onto a more exciting topic … our new stroller! Before we had Emma, I tried my best to research good stroller companies. But, like many of you, I was overwhelmed by an overabundance of marketing and information, and left frustrated and confused. Let me make this easy for you and tell you about a new stroller that we are “test-driving” — the BMW Maclaren. 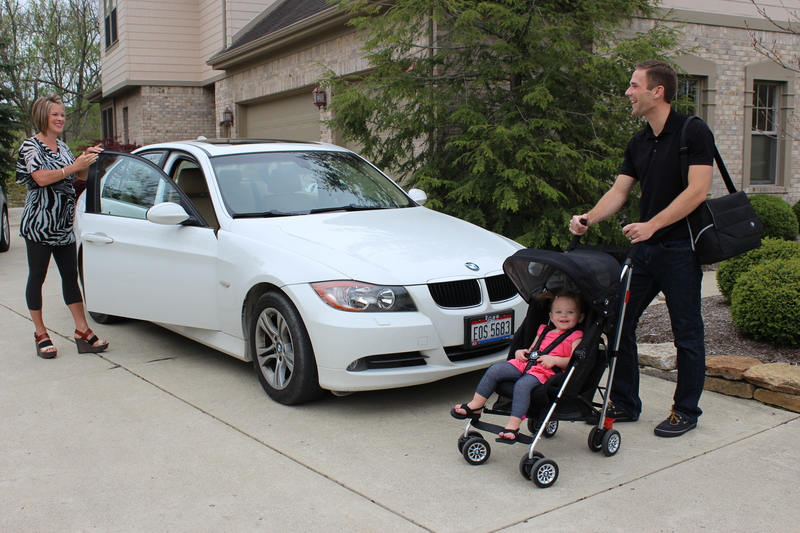 Over the past few weeks, Brandon, Emma, and I have been using the BMW Maclaren stroller. I honestly cannot say enough about this stroller series. All three of us are in love with the BMW buggy and looking forward to many more adventures. While my compliments of the stroller are endless, here are some highlights. The stroller is comfortable … both to push and for Emma to ride in. 1. The BMW Maclaren stroller is stylish: Hello … anything with the BMW logo is automatically stylish, but this stroller is sleek, elegant, and sporty. I absolutely love heading to the outdoor mall or park with our BMW Maclaren and always secretly hope that people notice the logo. We also have the BMW diaper bag and absolutely LOVE it! It is spacious and gives me the ability to store diapers, toys, wipes, and even my computer! This buggy is lightweight and easy to transport. 2. The stroller is comfortable for Emma. When she turned 6 months old, we purchased a stroller to take her to the park, mall, or on one of our many vacations. Unfortunately, the stroller was not comfortable for Emma. It hit her legs in a weird place and did not provide much cushion, so she did not like to spend much time in the stroller. However, The BMW Maclaren is so comfy for her. She gets sooo excited when we get the stroller ready for a ride and enjoys sitting in it for longer periods of time. 3. The BMW Maclaren is lightweight and easy to transport. No longer will we I be struggling to lift a heavy stroller into the car trunk or having a hard time folding up the stroller for easy transport. The BMW Maclaren is appropriate for all weather. 4. The stroller is appropriate for all weather. We live in Ohio. Ohio has a hard time making it’s mind up about the weather. One minute it could be gorgeous, and the next raining. Thankfully, the BMW Maclaren has a large, water-resistant hood with mesh viewing windows and UPF 50+ sun protection to shield Emma from the elements. 5. This stroller is safe. It has a 5 point harness buckle that is easy for me to secure, but not possible for Emma to escape out of. It also has rear reflectors in case we are out when it’s dark. I hope you will check out the BMW Maclaren site to read more and purchase today! Look for a post later this week about some great pregnancy teas that I am taste-testing. Also, please pray for me since my half-marathon is NEXT weekend. I am excited, but also nervous. I most certainly won’t be breaking any records, but it will be a lot of fun! Special thanks to Holly and Steve Neal, and Lindsay and Chris Beals, for supplying our “family vehicles” and helping with our fun photo shoot. Losing that stubborn belly fat…the final frontier of post baby weight loss. Those are some neat strollers! Love that you can get more than one color as well!! Checking them out now! Thanks for all the info! Reblogged this on Healthy Food Fit Family. stroller looks really nice! My family lives in Ohio as well, and you are right you never know what your going to get day to day in terms of the weather! They’re gorgeous! Almost as much as your little gal. Just have to settle on a color. They’re both so nice but in very different ways. Better hurry I suppose, these things are going to sell like hot cakes. Thanks for the great write up on this stroller. Our stroller is our little one’s primary mode of transportation (we have a 3 year old Volo) as we don’t currently own a car, so either walk or use public transportation. At some point in the future we’ll be looking to replace the volo and this might just be at the top of the list! Love the quality Maclaren offers. We didn’t have a car with baby #1 and we only used the Maclaren Techno! It was such a blessing to be able to have such a nice stroller to take on and off the bus!